Things started out badly when I missed my flight out of Juneau after waiting in the baggage line for 45 minutes (I showed up an hour and 15 minutes before my flight, and Juneau's airport is tiny. But Alaska Airlines refused to check my bag because I was "too late" and I had too much necessary gear to just leave it behind.) The next available flight was five hours later. I had to call and cancel plans with a few friends in Anchorage, which really bummed me out because the Anchorage visit surrounding the race was really the main reason I was going. I burned up what was becoming a beautiful day by taking a scenic drive out to the end of the road and mulling whether I should cancel the whole trip. I let my uncertainties linger, and without ever making an assured decision about it, I ended up on the plane flying north. My friend Amity and her baby, Josie, met me at the airport and we went to Speedway Cycles to pick up a bike that a man named Danny, who I've never even met, was letting me borrow. I was expecting something pretty basic or even a beater, but the mechanics presented me with a freshly tuned full-suspension Specialized S-Works Epic. A real race bike. I handed my camera to Amity and told her to take a picture of me at the start, because it was probably going to be one of the nicest bikes I ever had even short-term possession of. The photo turned out blurry, but you get the picture. It rained in camp the night before but by morning it was bright and beautiful. Nearly 40 people showed up at the race start. I had slept pretty well despite sharing a tent with a 9-month-old baby in close proximity to a dozen other racers. I had a good stock of Sour Patch Kids, chocolate covered coffee beans and tuna. I felt pretty good. "It's possible I can really do this," I thought as well took off up the long, 3,000(+)-foot climb to a summit that we would have to crest three times. 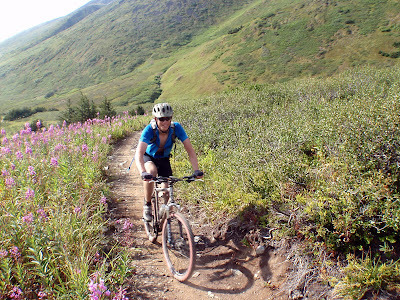 The Resurrection Pass trail on the Kenai Peninsula has to be the best bike trail in all of Alaska. 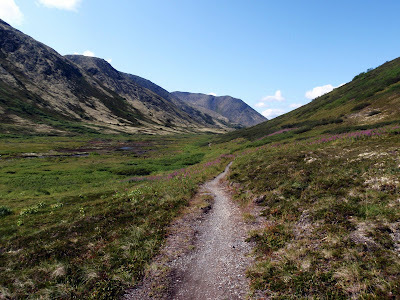 It's 40 miles uninterrupted of singletrack from point-to-point; it was built for walkers but is nearly 100 percent rideable, even for people of my skill set, and offers really quick access to some amazingly scenic Alaska backcountry. 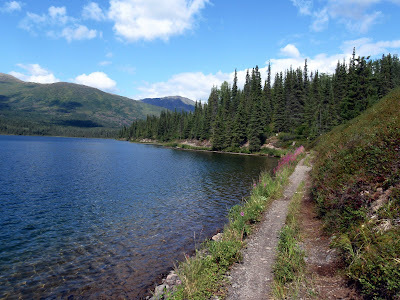 I love this trail, and I never get a chance to ride it because I live all the way in Juneau, which is for all practical purposes in a different country than Anchorage. I knew when I crested into the alpine tundra that the scenery alone was worth the price and hassle of the plane trip. However, by the time I started descending toward Cooper Landing, I knew I was in big trouble. I had taken a couple of falls on some root-clogged sections making silly mistakes that I usually only make when I'm really fatigued. My energy level was dropping rapidly despite the chocolate coffee beans, and both of my heels were on fire. I'd suspected that the Divide left me with achilles tendonitis, and the searing pain seemed to confirm my fears. It took me more than five hours to reach Cooper Landing, mile 45. I lingered around the trailhead for about 20 minutes, drinking water and mulling my situation. I was pretty certain at that point that a scratch was inevitable. But Amity wasn't at the trailhead and I didn't feel like begging a ride, so I decided I should try to get myself back to the start. I had traveled too far to not at least give it my best shot. The ride back up to Res Pass was borderline agonizing. My heels screamed with pain every time I pushed hard to power up a hill, but walking hurt almost as much, so on anything steep I just stepped off the bike and gimped slowly. The pain was annoying but I questioned whether it was really unworkable. After all, I was in for at least 90 miles of the race. I might as well do all 110 and finish the thing. But the 20-mile Devil's Pass spur included another 2,000-foot drop and climb. 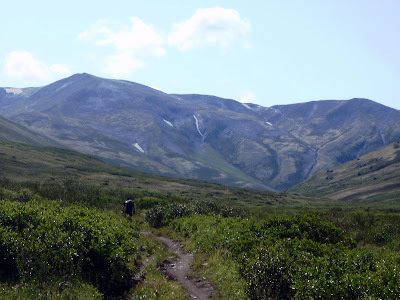 And I kept thinking about the 2007 Susitna 100, when I started experiencing knee pain three miles into the race and continued to push through it for 20 more hours. I ended up with advanced chondromalacia an couldn't ride my bike for three months afterward, and still struggle with occasional "angry knee" to this day. 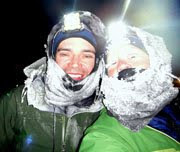 I still view the 2007 Susitna 100 as "the race I should have quit." And I started to wonder if it was really worth risking the rest of Juneau's short hiking season just to finish a silly race. Plus, I was moving slow enough at that point that finishing may have taken 15 hours or more, which would put me back in Hope late and potentially without a ride back to Anchorage. The 2009 Soggy Bottom was definitely becoming "a race that I should quit." And as soon as I made that decision, I felt great about it. I passed the Devil's Pass cutoff and continued riding straight without a tinge of regret. Shortly after the cutoff, I slashed the sidewall of the rear tire of my borrowed bike. The tear also destroyed the tube. I spent 30 minutes patching a hole in an old 26" tube that I was carrying as a spare, figuring out how to work the new pump I had just purchased in Anchorage, fixing an old piece of tire rubber to the rip and praying that the haphazard repair would hold, knowing that any other major tire problem would leave me with a 20(+)-mile gimpy walk back to Hope. After that, I took all my weight off the seat on all of the rooty sections, which was murder on my heels, but I wanted to preserve the tire as best as I could. That little mishap only further reinforced my decision to quit the race. I ended up back in Hope in time for the post-race festvities, with cold Coke and freshly grilled brats. I caught a ride home with Pete B., who actually managed to finish the Soggy Bottom in under 10 hours despite being hit head-on by a truck just over a month ago. 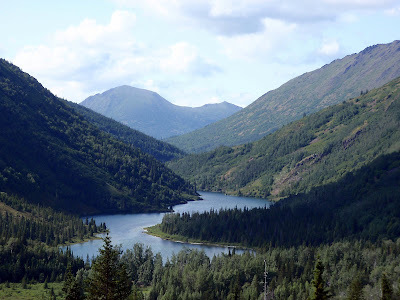 It was interesting to talk with him about that day on the Divide out of Summitville, Colo., and piece together the string of events surrounding the accident from our different perspectives while driving around the Turnagain Arm. I can't believe he's already racing again. He's definitely a tougher person than I. He was also nice enough to drive me to the airport at 6 a.m. this morning. 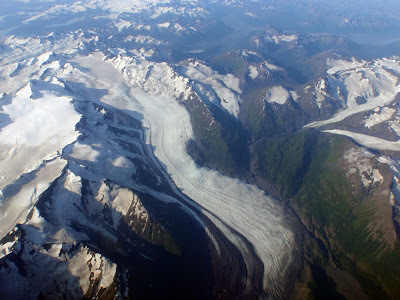 The trip over the glacier-capped Chugach/Wrangells was spectacular as it always is on a clear day - one of those rare occasions where the flight itself is nearly worth the agony of the race that coaxed me north in the first place. 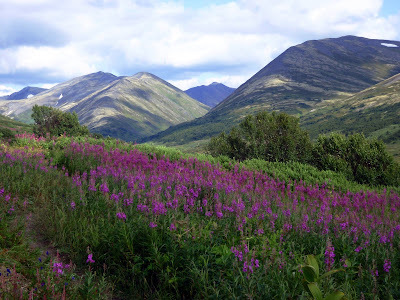 i wish i lived in ak - four months a year. All the junk food you ate on the GDR prbably heled contribute to your lasting fatigue. You took in enough sugary calories to keep you going, but probably not enough protein to keep your muscles from breaking down during the race. But sugary calories are my diet all of the time ... that and Diet Pepsi. I think muscle breakdown is definitely the culprit. I also think it's not possible to digest enough fat and protein to prevent that level of breakdown when you're burning 6,000-8,000 calories a day. It is definitely possible; nutrition is really important and you're seeing why. Junk food is just empty calories. I think you will almost certainly see some muscle breakdown no matter what you eat but it's not necessary to be totally debilitated for so long. Maybe next time bring some protein powder at least? a.) Be available at the smallest of the small-town gas stations. b.) Be calorie dense enough that you can fit roughly 10,000 calories in a space the size of half a shoebox. c.) Be something you can stomach after 12 hours in the saddle for 16-24 days straight. You'd be surprised how many of the fast, truly athletic guys follow a similar candy diet. I went into it knowing I'd be lucky to just get calories down. I've struggled with it so much in the past and even in training that I'm willing to accept anything I'm willing to eat. Tuna, peanut butter, nuts and other protein-rich foods were definitely in the mix. But, yeah, I'm not saying the Divide has made me a wonderfully fit person a month later. That wasn't exactly my goal. I had an amazing experience and I'm willing to pay my dues. From what I've heard from almost every Divide veteran I've talked with about it, wearing out the body goes with the territory. 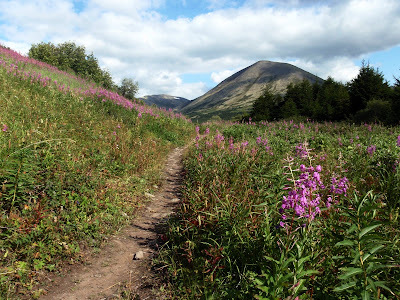 ummm, what about the Juneau ridge hike just two days before the race? A five hour vigorous ridge hike is not the best race prep, especially for someone who has just completed a long endurance race. That could not have been good for sore tendons. Were you perhaps setting yourself up for failure from the start? I won't even go into it with you about the lack of nutrition as it seems you are not open to that discussion, but trust me, as you age you will either change your eating habits or slowly stop being active, of that I am sure. It would be a mistake to believe that you could replace calories as quickly as you burn then in any race, even more so as a race as grueling as the great divide! At some point you body turns on itself and start looking for other sources of energy. Interestingly enough, calcium in your bones is one of the biggest losers! That aside, the loss of muscle, the strain put on ligaments and bones... it's a surprise you're able to walk at all. You should be looking to do some Yoga or similar to stretch out those muscles, as well as light weight work. Included in that should now be a recovery diet for at least a week or two... and that does not mean sweets! Hope you feel better soon, love your blog! Any autographed books left? 1) You were just too worried about breaking that nice bike! 2) Since the race is more like 110 miles, doesn't 90 count too? 3) You needed even more candy and needed to quickest route to get some chocolate and yummygummies. 5) There weren't any hot guys ahead to chase. 6) You had an off day. 7) You had two sprained ankles. 8) Screw it...your Jill, conqueror of the Divide Race...you can do anything now and still be admired! I see the tough love crowd has tickets for the comment room tonight. Jill, I can only add a few items worth thinking about in the nutrition area for both long hard races and faster recovery. I bet you are aware of these already but here is my two cents worth. 1. I use those Expensive Daily SoftGel Multivitamins manufactured in the United States with verified ingredients which are formulated for the individual needs of men and women. "STAY AWAY FROM CHINESE VITAMIN PRODUCTS AND VITAMAN MANUFACTURERS USING CHINESE INGREDIENTS. The SoftGel Vitamins absorb into the body much more completely than coated tablet form and work wonders with daily use. I am not a Doctor and you should consult a doctors advice on vitamin use if you are taking medication/s, have certain allergies, pregnant or lactating. I can send some brand names of High quality trusted Vitamins your way if you like. 2. Energy/Electrolyte drinks and 100% juices..and I don't mean that toilet bowl stain remover called Pepsi! I have a very good inexpensive homemade non commercial electrolyte mix you add to drinking water...if you want the recipe just ask. Simple to make and low weight on the trail. 3. Try using measured amounts of those formulated Protein Powders body builders use mixed into other foods to make complete balanced nutrient rich meals of Protein, Carbohydrates, good fats, fruit,fiber and Dairy. Placing the Protein powder in one small water tight bottle and a dry whole grain cereal in another weighs almost nothing for the huge energy and body upkeep provided, add some course chopped Almonds and ground flax seed along with certain dried fruit plus some dairy and you have what the Special Forces guys use as no cook meals or boil water and eat hot meals to keep strength up in low load out backpacks...This is just one example of many I use on the bike. 4. Stay as far away from most Clif type bars and convenient store granola bars/snacks which claim good nutrition...in most cases they are nothing more than expensive Snickers bars; I say eat the Snickers and leave the Clif crap on the store shelves...I have great replacement recipes which actually taste good and provide real nutrition...all you need to do is ask. 5. Like others mentioned before me...take it easy for about 5 to 10 days before a huge race. Lower those workout intensities the closer race day looms so the body stays at peak condition but does not strain and of course load up on those prerace day foods. Many "Extreme GO People" actually report that with much milder workouts before a big race they mentally become like a Rabid Dog trying to break that stretched chain to bite the Mailman or a team of sled dogs ready to run... That was my bad analogy for bike racers driven to be first on the hole shot at the starting line. Mike In Wisconsin, recovering from the MS 150 Best Dam Bike Ride this past weekend. Jill - that is truly amazing scenery! The 90 miles you completed sounds like it was both painful and wonderful. It's a huge accomplishment even if you didn't finish. My wish for you is to take the time and care to heal up fully so you can continue to enjoy hiking and biking for many years to come! You made the right choice not trying to do those 20 extra miles of mountain! All I'll say is that the red bike looks good on you. You need to get one. That IS a great bike, and the lender is a saint for allowing a stranger to use it for this specific race. It is important to care very much about the condition of the bike when doing this type of event. You cannot push beyond the limits of the bike, nor can you trash the bike simply to get done 10 min faster, because it IS your fastest, safest way out of the mountains. Walking out is certainly an option, but no one is coming in to rescue you, unless you are seriously injured and immobile. Unfortunately for the lender of the bike, it was returned in abysmal condition. Not even rinsed off with a hose, which was readily available for all riders. I certainly hope that you at least pay for the tire. It is certainly your choice to do this race on a whim, have poor pre-race planning (i.e. no tapering), and to poor nutrition during the race. I am sure that it was NOT the lender's choice to have his bike returned in that condition. Maybe Divide racers should go a-huntin' and a-fishin' or a scrapin' road-kill to get that protein. You just finished riding 2000+ miles from Canada to Mexico in record time? and jeez about the bike, why not send her an email instead of a public dressing-down? Wow. Harsh comments. Good lord. I say ... congrats. As someone who just careened (spelling) off a cliff on the Crescent Lake Creek (a very easy trail) because I accidentally hit a rock the wrong way ... I can't imagine going 90 miles in one day. I love the blog. I had the sense when I was reading it that you were justifying the decision to "quit" (90 miles is not exactly quitting). I know the feeling. I recently did not finish a 1/2 ironman I trained for because I suffered heat exhaustion at mile 50of the 56 mile bike (right before the 1/2 marathon portion of the race). I spent weeks ... months .. convincing myself that I didn't quit (I felt like a quitter and I was embarrassed), but that I had to stop. I was sick. I tried to tell myself that I could have just kept on going (in spite of throwing up three times). But it just wasn't my day. I am from Alaska. And I gave myself a day to transition to the east coast time zone and 95 degree weather. Dumb! Next time ... I will finish! I understand that feeling of forcing yourself to eat. That makes so much sense to me. I am the same as you. Sweet things are easiest to eat when your body just doesn't want to accept food! Plus, I don't think a gas station hot dog is any better than a snickers bar. Or a Clif bar. I also understand that when there is good weather in Juneau, you get out and enjoy it! I lived there for years! I mean, you cannot let those days pass you by. Even if it puts the taper out of whack. That's just life in Juneau. Unless you have lived there, you just don't get it. I think you are awesome. Putting all the stuff out there invites criticism. And, probably (like everything in life), some of it is well-placed. However, you inspire me. You are not a quitter. Some days it is best just to enjoy being outside in Alaska. It sounds like you did just that. Job well done! Hope you feel better soon. Congrats on those 90 miles! And you should be proud of your wisdom to leave the race when you were hurting! Yeah, nutrition... that's a tricky one. For some it can be hard enough to get it right at home, much harder in a race like the TD. I for one would love to ride the TD (note: RIDE, not race) and know too well I wouldn't last more than a week on that diet. Totally agree that you should save yourself to enjoy the summer in Juneau. Anyone living at these latitudes fully understands you. Maybe you should take it easy for awhile... Take care of yourself! You wouldn't want any permanent injuries. We would like to say you are doing it wrong. bugz, you could eat bugz. I did offer to buy the owner of the bike a new tire. I don't know if slashing a sidewall of one tire is really considered "trashing" a bike, nor is getting it covered in mud. I admit it was rude to return it dirty. I did not have an opportunity to clean it. I had to drop it off with another Good Samaritan in Hope (another saint) to return it to Anchorage for me because I had to be at the airport to catch a plane less than eight hours after I stopped riding. The trip was way too rushed. I realize that now. Thanks to everyone who did me huge favors to help me get through it. As for the criticism about my nutrition ... it's always interesting to me how much people presume to know about me based on what little I reveal on my blog. Sure I ate crap for three weeks on the Divide, but that doesn't mean I'm sitting here now munching on brownies and Snickers Bars. How do you know what I've been eating for the last four weeks? I mean really? The worst part about not finishing the Soggy Bottom is that I do now have achilles pain that is probably going to prevent me from really enjoying more good weather in Juneau. As far as not finishing the race, ah, who cares? I had a great ride. I don't regret anything about it, actually. Your comment: "it's always interesting to me how much people presume to know about me based on what little I reveal on my blog"
A blog is a snapshot of a moment in time, not a detailed autobiography or the movie that details your life story. I wouldn't presume to criticize or critique your exercise or dietary habits until I completed my equivalent of the Tour Divide. And some folks here need to bike 2000+ miles in your moccasins. Please heal and continue to LiveStrong. I love the blog, keep up the good work. Thanks again for sharing your stories and photos with us. I take them at face value and always find them worth my time. All the trolls love you. I'm sorry for that. For all they know you could be a 50 year old guy writing from a motel room in Alabama. Clip-in shoes would help on a one day race like that. I think it save some energy and give much more control thru the technical and ups. as far as diet... that freshly caught salmon, looked delightfully delicous. I doubt there are too may GNC's stores along the route. that comment from "The Internet" is hilarious and dead-on. these people criticizing your diet sound like tons of fun to be around. perhaps they can start their own blog in which they chronicle their impeccable food intake, and no one will read it. i hope you won't stop telling us the gory details, jill. your writing is so much richer for it. you're a powerhouse, and it is a blast to follow along! Please don't confuse well meaning and thoughtful advice with criticism. Some of those folks seemed to offering useful comments and sounded as if they had good knowledge about nutrition. You do tend to emphasize your junk food diet, both on and off the race trail. I do not recall seeing any posts about nutrition beyond Diet Pepsi and junk snacks, although I may have missed some. If you have a recovery nutrition plan, it would be interesting to hear about it. You write about almost everything else, and there is an obvious interest in what you eat, so why not give it a shot? Nutrition is such a big part of almost every other endurance athlete's life, it only makes sense to flesh out that subject a bit more. You're right. Most people are just trying to give advice, not be critical. It's just the presumtion of the advice that irks me. It's like announcing that you ran a mile, and having people lecture you that you're not training hard enough for a marathon. Why would they assume you're training for a marathon? I don't eat while cycling unless I am literally going out all day. Then I eat the usual - Clif Bars, Shot Bloks, and yes, candy. I hate eating while I'm riding, and generally my huge diet and my fat-burning pace keeps me well-energized through most rides. But because I struggle so much to eat while exercising, I've come to the point where, while riding, the only thing that matters are calories. I can't even stomach the Clif Bars and Shot Bloks under long effort, and I've literally thrown up Perpetum (I despise all liquid nutrition drinks I've tried. It's like trying to drink gasoline.) Candy goes down smooth and it always goes down. And unless someone has bonked as wholly and irreversably as I did on the Iditarod Trail in 2008 when I was barely able to stuff down dried cranberries, then it's true - I'm not willing to listen to criticism about it. Let me get myself out alive first, then hold me to good nutrition. Did eating candy and fast food for 24 days straight on the Divide hurt me? Probably. But I got through it. That to me is the most important part of nutrition in a long event. 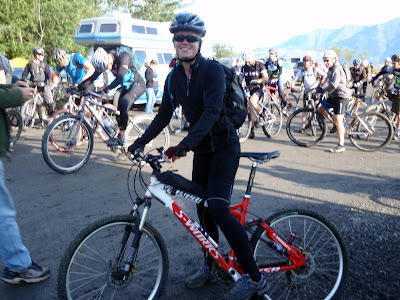 I guess another thing that bugs me about well-meaning advice is that, because I keep a blog based almost solely on biking and occasionally enter races, many people assume I am interested in being competitive. I am not. I am interested in being healthy and having the energy and fitness to go out for a 12-hour hike or a 600-mile bike tour whenever the urge and opportunity hits me to go. I am not as much interested in shaving minutes off my race times. I really enter so few, and I'm often just in them for the fun and challenge surrounding them, and the way they motivate me to get out almost daily and "train". My current nutrition and fitness does just fine in this regard, and it fits well with my go-where-I-want-to-go lifestyle. I don't like regimines. I like flexibility. And while I acknowledge that regimines are necessary to increase competitiveness, that's just not where my interest lies. It is definitely possible; nutrition is really important and you're seeing why. Junk food is just empty calories.